This textbook is intended to serve as a refresher for all mortgage loan originators, whether experienced or new. It includes topics that map to the SAFE Mortgage Loan Originator Test National Component with Uniform State Test Content Outline. Chapter 1 is a review of federal lending legislation, including RESPA, TILA, ECOA, and other federal laws and guidelines. Chapter 2 provides a review of nontraditional mortgage products, including mortgage programs, mortgage loan products, and terms used in the operation of the mortgage market. Chapter 3 discusses ongoing concerns with ethical behavior as well as associated acts designed to address these issues. Chapter 4 prepares the student by reviewing key terms and concepts associated with mortgage origination activities. Chapter 5 provides key terms and concepts associated with mortgage origination activities in general and covers key highlights of the SAFE Act and uniform state content topics included in the UST component of the SAFE MLO National Test with UST. 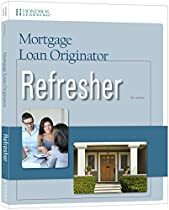 The textbook also includes an appendix on financial calculations, plus chapter quizzes and a section that includes practice exams to help you gauge your knowledge in key topics areas before actually taking the SAFE Mortgage Loan Originator Test.